On these pages we look at concrete categorories. One definition of concrete categorories is a set together with some form of 'structure' such as functions and operations within the category. The only arrow is the arrow back to itself (identity arrow). For instance: if the object is 'set' then the whole thing is a monoid. The arrow from first to last is implies by the composition law. Here we avoid loops (exept identity) which would mean that something else is going on (such as isomorphism or adjunctions). In order to get an intuitive understanding of category theoretic constructions I find it helps to use examples from the simplest concrete categories to show what is going on internally, especially if it can be illustrated graphically. Of course, we are not really supposed to look inside categories, but I think its necessary to get an intuitive understanding. Often sets are the simplest category to show whats going on. If sets don't have enough structure the a pre-order (see this page) is often a good example to use (on this page I have tried to use preorders to show the idea of adjunctions). pre-orders are good because of the graphical nature of Hasse diagrams. If a relationship is reflexive then there is always an arrow from an element of a set to itself. Although when drawing the Hasse diagram we may not draw it to avoid clutter. This is like composing functions. That is: if the is an arrow from 'a' to 'b' and an arrow from 'b' to 'c', then we can attach the tip of the first arrow to the second arrow to get an arrow from 'a' to 'c'. For a discussion about the theoretical links between category theory and computing see this page. 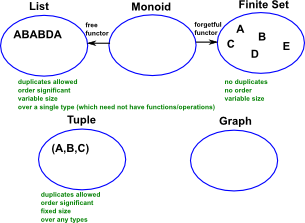 For a discussion about modeling datatype see this page. Groups involve elements and a single operation sometimes called multiplication. Groups are often categorised in a way that is independent of the number of dimensions. youtube - Joost Vercruysse: "Kleisli Hopf Algebras"
The Princeton Companion to Mathematics - This is a big book that attempts to give a wide overview of the whole of mathematics, inevitably there are many things missing, but it gives a good insight into the history, concepts, branches, theorems and wider perspective of mathematics. It is well written and, if you are interested in maths, this is the type of book where you can open a page at random and find something interesting to read. To some extent it can be used as a reference book, although it doesn't have tables of formula for trig functions and so on, but where it is most useful is when you want to read about various topics to find out which topics are interesting and relevant to you.